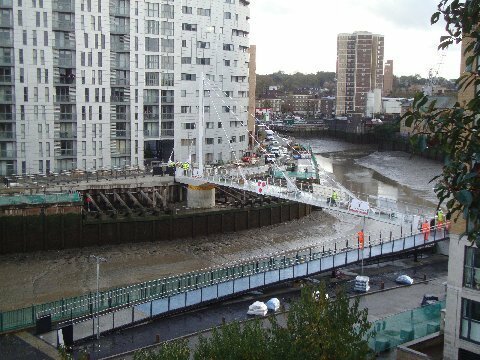 Deptford Creek Bridge was opened this morning by the Leader of the Royal Borough of Greenwich Council, Denise Hyland. The swing bridge, which links up the Thames Path between Deptford and Greenwich, is the result of a long campaign by Greenwich Cyclists and others. But now, people will be able to enjoy a pleasant route without the need for the unpleasant diversion onto the main road, as shown on the Open Street Map below. The bridge - the first of its design in the capital - will swings open like a door to make way for boats, with the help of four electric motors that can rotate it 110 degrees in under two minutes. 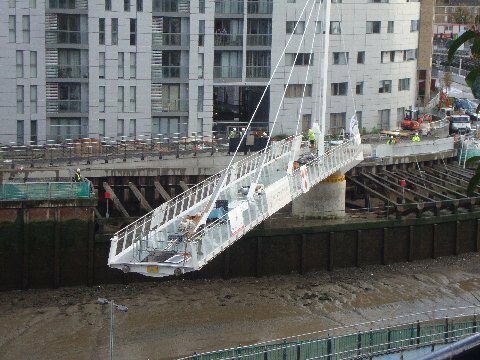 These pictures from Southwark Cyclists, taken last year, show the bridge in action.